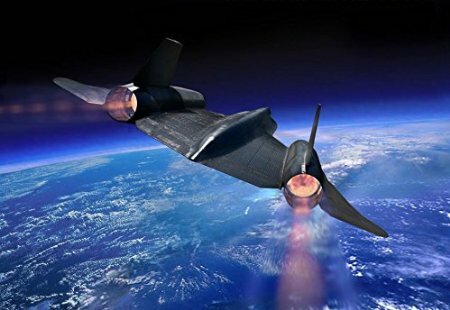 The performance figures of the A-12 have only recently been declassified. The A-12 flew faster and higher, Mach 3.29 at 90,000 feet, than any other piloted operational jet aircraft, including the SR-71. "The Peacekeeper" depicts an A-12 , piloted by Jack Weeks (CIA) passing making a right turn over the India Ocean as he searches for and locates the USS Pueblo, which was seized by North Korean naval forces. Reproduced on Archival Museum Quality paper stock, each "The Peacekeeper" print is individually inspected and signed by the artist. An open edition print signed by the artist only is $65. A special limited edition of 100 signed and numbered artist proofs are available for $165 in the 22" x 28" format. A medium sized print is also offered for $40.00.
. A near perfect replica of the original painting, Giclée prints are limited to only 50 examples of each image, and are created for the most discriminating collectors.